Transparency Market Research points out that the competitive landscape in the global human growth hormone market is fairly consolidated. Players continue to focus on developing products with minimal side effects. To expand business to newer markets several vendors are looking at mergers and acquisitions. Collaborations has become an important part of talent acquisitions for better drug development. For instance OPKO and Pfizer are collaborating to develop and sell human growth hormone hGH-CTP for treating adults and children. Some of the leading players operating in the global human growth hormone market are Merck KGaA, Eli Lilly and Company, Pfizer Inc., Novo Nordisk A/S, and Novartis AG. According to the research report, the global human growth hormone market is expected to be worth US$ 5,261.5 mn by the end of 2026 in terms of revenue. During the forecast years of 2017 and 2026 the global market for human growth hormone is projected to surge at a CAGR of 6.2%. Out of the many routes of administration, the subcutaneous route of administration is projected to garner the highest revenue of US$1,600 mn by the end of 2026. It continuous to be the most preferred type of chronic growth therapy. From a geographic point of view, North America human growth hormone market is expected to remain in the leading position to strong presence of players. 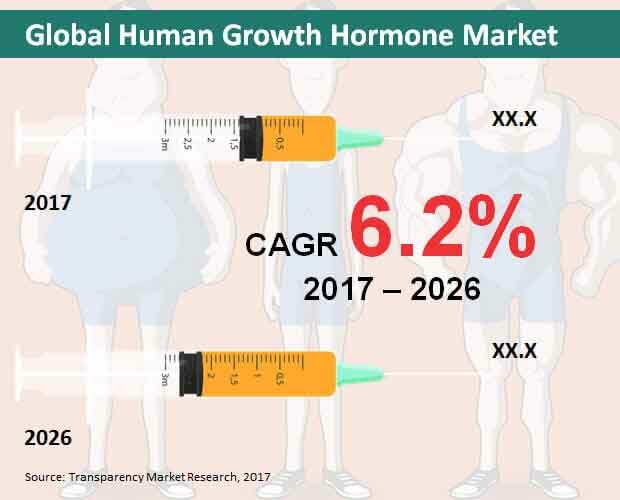 The growing application of growth hormones in treating many diseases and conditions has created a plethora of opportunities for the global human growth hormone market. The global market for human growth hormone is also being driven by the increasing awareness about the effectiveness of growth hormones in rectifying short statures. Children suffering from congenital conditions have significantly benefited from growth hormones. Meanwhile, adults with issues pertaining to pituitary gland have also led to a growing demand for human growth hormone therapies. Today, rising incidences of HIV/AIDS, growing research and development of long acting drugs, increasing cases of cancer, improving expenditure on healthcare, and commonly found growth hormone deficiencies have all augmented the global human growth hormone market. The research report also points out that rising incidences of pituitary tumors, neuropsychiatric-cognitive, skeletal abnormalities, neuromuscular, cardiovascular, and metabolic abnormalities are expected to seek human growth hormone therapies as effective solutions. Majority of these ailments can be alleviated with the help of growth hormones. The report also states that the human growth hormone therapies are predominantly used for Tuner syndrome as these treatments are designed to treat poor sexual as well as physical developments. Thus, the increasing scope of application of human growth hormones is projected to take the global market to newer heights. On the flip side, the global human growth hormone market is challenged by a few elements. The high cost of these drugs and therapies is the key reason holding the market back from achieving bigger market size. Additionally, illegal usage of growth hormones amongst sportsmen has become the biggest challenge for the global human growth hormone market. The report emphatically states that the adverse side-effects of these drugs is also been a major concern for the overall market. This review is based on Transparency Market Research’s report, titled “Human Growth Hormone Market (Route of Administration- Intravenous, Subcutaneous, Intramuscular, Oral; Distribution Channel– Hospital Pharmacy, Retail Pharmacy, Online Pharmacy, Clinics; Indication- Growth Hormone Deficiency, Turner Syndrome, Idiopathic Short Stature, Prader-Willi Syndrome, Other Indications) - Global Industry Analysis, Size, Share, Growth, Trends and Forecast 2017 - 2026”.